Ramelli is a family owned business since 1909. In that time the company has grown and is now comprised of multiple companies will one thing in common, service. The primary company, Ramelli Janitorial Services, is a fifty-year-old organization. Being a full-service, commercial, residential and industrial Janitorial Services over fifty years, we have the knowledge to take a personalized approach to every client. As new business and customer demands surfaced the fabric of the company expanded. Today Ramelli Group consists of Premier Stone Services, which is a vital part of the company because it assists with any group restoration needs. 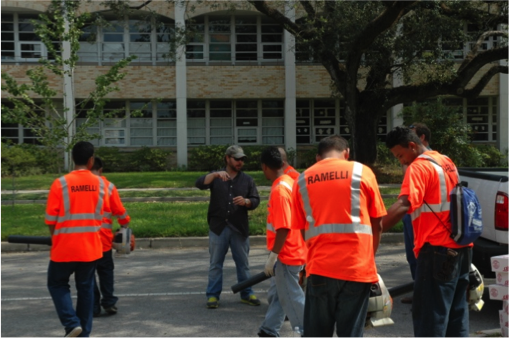 Ramelli Waste was added in 2005 and is recognized as one of the fastest growing waste management companies in the greater metropolitan New Orleans Area. The Ramelli Group is a quintessential Louisiana company. As our slogan states, “Service is Our Heritage” and the majority of the service has been, and will continue to be concentrated around Louisiana and the Gulf Coast States.